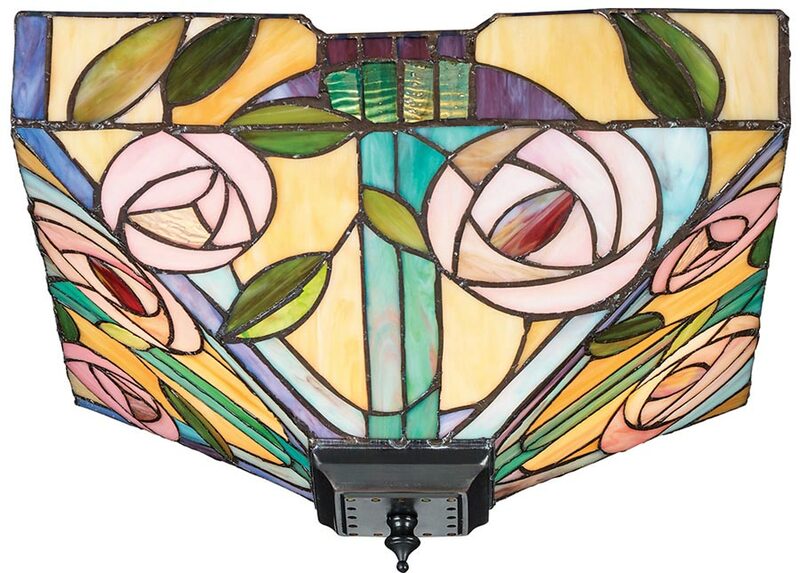 The Willow Mackintosh rose, medium 2 light flush Tiffany lamp is a delight and sure to brighten anyones day. Stunning handmade rose design inverted Tiffany lamp shade, typical of the Mackintosh style on a stunning pyramid shade with drop sides, covered in subtle colours with a feature pink rose, highlighted with a red centre. A complex design using pastel colours to complement a neutral interior. This medium semi flush Tiffany lamp is fixed to a concealed ceiling mount by a dark antique lower finial. This is a hand-crafted Tiffany shade and the colours may differ slightly from the image shown, as each piece of glass is hand-made and may differ slightly in colour or shade. This should not be seen as a fault, rather something that makes each Tiffany shade unique. Part of the Willow Tiffany lighting range, inspired by the Mackintosh rose with a subtle twist. A wonderful inspired design that will brighten any room.